In Saint James, whose feast we celebrate today, we have a complex character and an important lesson. The Gospel today recounts the incident where the Apostle’s mother, Salome, beseeches Jesus for a favor: that her sons, James and John, be seated at his right hand and left hand in the kingdom. Yes, James was a fisherman who, along with his brother John, was called by the Lord to drop everything and follow him. But he was not so poor, because we know that his father was successful in the family business and his mother was one of the women who were financiers of Jesus’ mission. So perhaps he felt a little superior to some of the other disciples? He did get to witness the Transfiguration, he offered to call down fire on a Samaritan town, he was the first Apostle to be martyred, and he and his brother were called “Sons of Thunder,” probably for his fiery temper. So he was something of a big deal. But he was also trying to put himself first. He and his brother put his mother up to asking Jesus for a favored position, probably because he knew it was bold and misguided. Jesus rebuffs the request. James was also the target of one of the Eight Rebukes of Jesus in the incident of offering to destroy the Samaritan town mentioned before. 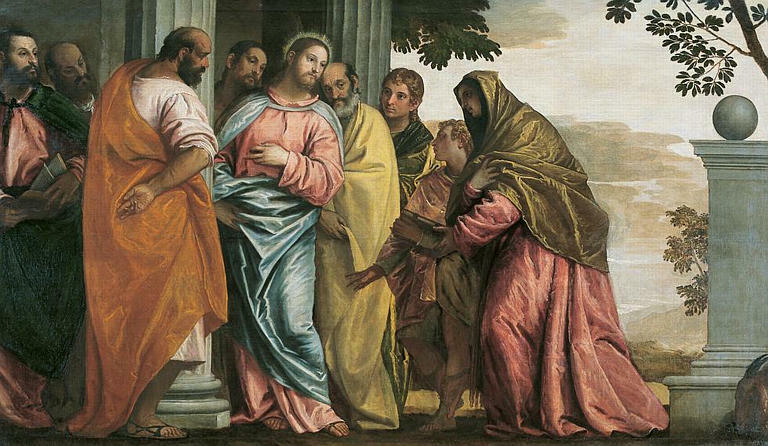 And yet even though he still didn’t “get it,” he was one of the twelve Apostles and important to the mission of Jesus. And so he is an important lesson to us: nobody’s perfect, but we are still loved by the Lord – and even given great responsibility to spread his word. Throughout the Gospels, we learn that your station in life, your wealth or lack of it, your talents or lack of them make no difference in the final calling. And what proof do we have of this teaching? It is the life of Jesus…and his suffering and death. Time and again we are taught that we must be servants, even those of us who are of the highest station, and we must be willing to sacrifice ourselves for others, rather than seek glory and riches. Because that is exactly what our Lord did: he sacrificed himself on the cross for our sins and our redemption. His was the ultimate commitment, and he asks no less of us. The last shall be first, and the first last. Paul says, “We who live are constantly being given up to death for the sake of Jesus.” In other words we may fall over and over, we may succeed over and over, but what we are living is the spirit of redemption every hour of every day. And so if we fall, we know intimately that we will be raised up if we ask for it, because God’s mercy is everlasting. Although this life may seem like the life of Sisyphus, constantly pushing a boulder uphill only to have it roll to the bottom time after time, when we really contemplate our lot, we can always remember that Jesus told us the truth: our yoke is easy and our burden is light. Lord, help us today to renounce our pride or our consternation, our smugness or our fears, our complacency or our anxiety and remind us that everything is for you and you are everything for us. And like Saint James, though we may at times deserve rebuke, we can be assured of our salvation.